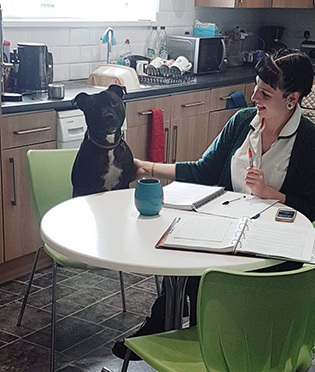 A Suitably Qualified Person (SQP) is an animal medicines advisor, a legal category of professionally qualified persons who are entitled to prescribe and/or supply certain veterinary medicines under the Veterinary Medicines Regulations. 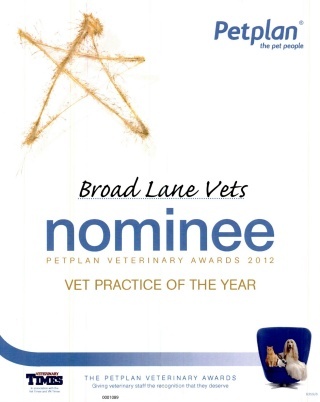 At Broad Lane we feel it is important all our team receive a high standard of training relevant to their role. Our receptionists and student nurses undertake the SQP qualification as part of their training. To qualify as an AMTRA SQP a person must undertake relevant training and pass written examinations approved by AMTRA at Higher Education Level 4, and pass a viva (oral exam) conducted by an AMTRA Assessor. And good luck to six other team members currently training. We have extended our hours from Monday 4th September 2017. Did you know you can now book an appointment at our Radford Road surgery on weekdays? Don’t worry you can still pop into our open surgeries; Monday to Friday 9-11:30am and 4-6pm, and Saturday 11am-12.30pm. 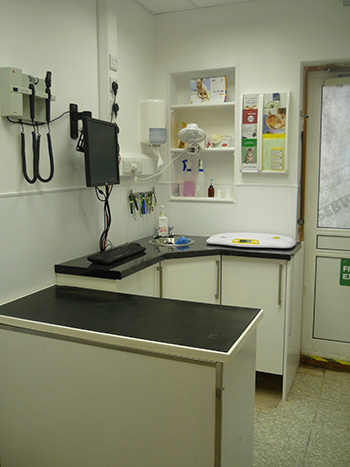 However, if booking an appointment time is more convenient for you, a second vet will be running these alongside our open surgery. Call us on 02476 598828 for more information. 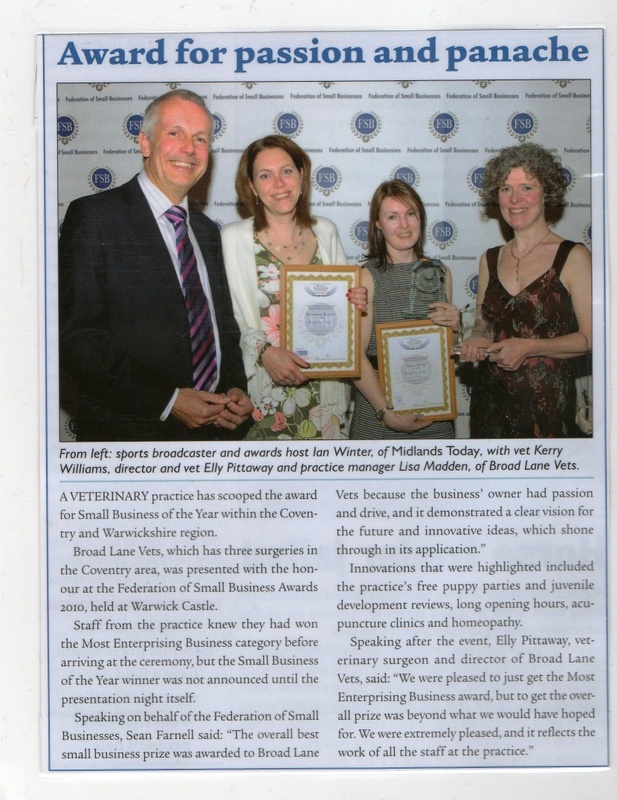 We are pleased to have been awarded the Timewise "Most Flexible Small Business" Award. You can read all about it here. During the recent refurbishment at Broad Lane we have had air-conditioning installed. Perfect for your comfort, and that of your pet. 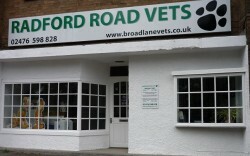 We have reason to celebrate at Broad Lane Vets. Hayley Carroll, Lucy Pauley and Sophie Phipps have all qualified as Registered Veterinary Nurses. Christine Lowe, Fiona McAllister, Georgina Maude, Lauren Holtom and Heidi Clifton have all become SQPs. Well done everyone!! 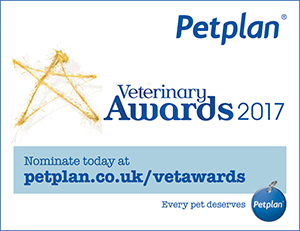 Thank you to our our clients, and their gorgeous pets, for the numerous nominations we have received for Pet Plan's 'Veterinary Practice of the Year 2015', and for nominating Ali White and Kerry Williams as 'Vet of the Year 2015'. Our Veterinary Surgeon, Stephanie Johnston, is currently training hard in Australia. She has taken extended leave to try to qualify, with Team GB, for the Rio 2016 Olympics. Steph plays Rugby for Worcester, and Scotland, and we wish her every success. Thank you for your patience whilst refurbishment is taking place, at our Broad Lane site. It will be worth the wait. 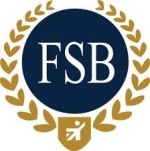 Keep an eye on our website, and social media pages, for updates. Why not join us on Facebook, Twitter or Google. 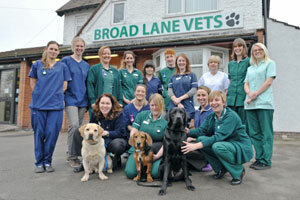 Free Micro-chipping for all dogs at Broad Lane Vets! 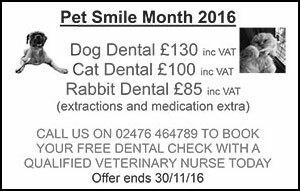 There will soon be a legal obigation for all dogs to be chipped so dont miss out! 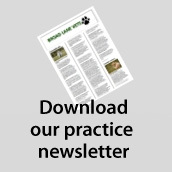 Our VN Awareness Month exploits made it to the national veterinary press. 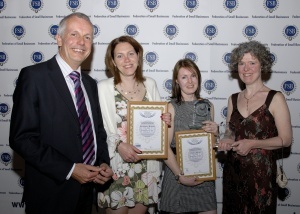 Well done to our fab nurses and all the practice team. 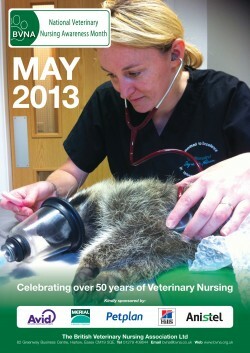 May is Veterinary Nursing Month. To celebrate this our nursing team are holding an All-Day Tea Party at 255 Broad Lane. 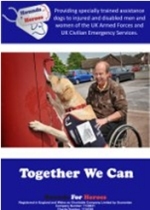 Please come along between 10am and 6pm on Monday 13th May to support them. 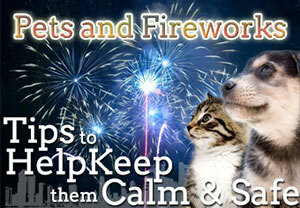 All monies raised will be split between our chosen charity ’Hounds for Heroes’ and ‘The Blue Cross Paws for Tea Fund’. Our nurses are offering free check ups throughout May. 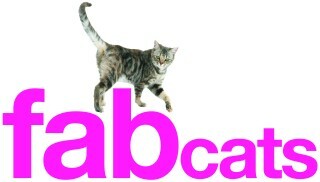 Please call us for more information or go to www.rabbitawarenessweek.co.uk . 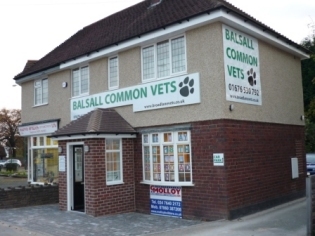 We know how stressful a trip to the vets can be for you and your cat, so to help you we are now offering Cat-Only-Clinics on Wednesday afternoons at our Broad Lane site. 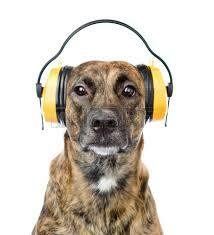 This will allow your cat to have a peaceful wait without any dogs to upset them - please telephone us on 02476 464789 for more information. 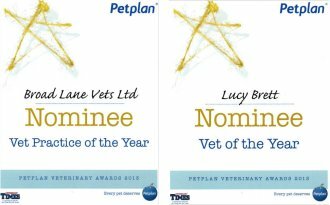 Thankyou to our our lovely clients and their wonderful pets for nominating us for Pet Plan's 'Veterinary Practice of the Year 2013', and for nominating Lucy Brett as 'Vet of the Year 2013'. 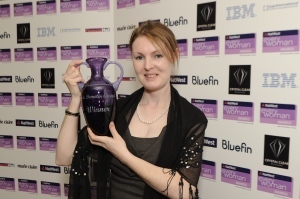 Our Director, Elly Pittaway, is the "Natwest Everywoman’s Young Business Woman of the Year 2011"
Broad Lane Vets is the FSB Small Business of the Year 2010 - click here to read more.